Bún mắm is a robust Vietnamese soup that’s packed with contrasting flavours, textures and colours. Pungent, fishy, sweet, sour, dark, vibrant, silky and crunchy, this is a soup that challenges your taste buds. There’s nothing subtle about bún mắm: it’s bold and confrontational – each flavour and texture is in a fight to dominate your palate. Such is the density of bún mắm, that you’ll discover something new each time you try it. The Mekong Delta is famous for being the rice basket of Vietnam, so it seems fitting that bún (a thin, white noodle made from rice flour) is one of the foundations of this soup. Second to rice, the Mekong Delta is famous for its fish. Mắm is a potent, fermented fish sauce that’s the other essential ingredient in this soup; it’s what gives the broth its pungent, fishy aroma: bún + mắm = bún mắm. With the fundamental components of bún and mắm in place, early cooks looked around them for other ingredients to add body to their soup. This being the Mekong Delta, they were spoilt for choice. Into the broth went tamarind, spices, lemongrass and eggplant, while all sorts of goodies were dropped into the bowl to accompany the noodles: little fillets of white river fish, chunks of fish cake, squid, whole shrimp, slices of aubergine, and crispy cuts of roast pork belly. 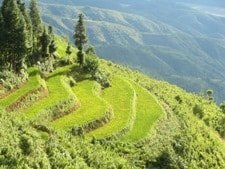 The latter may have been the influence of Chinese migrants in the Mekong region. 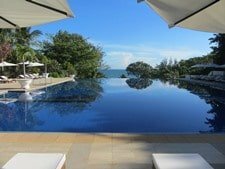 In fact, many people speculate that the origins of bún mắm lie not in Vietnam but in neighbouring Cambodia, whose Khmer empire once ruled over what is now southern Vietnam. 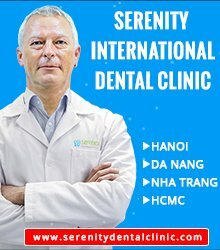 Even today, in the Mekong provinces of Sóc Trăng and Trà Vinh, there’s still a healthy population of Khmer and Chinese. Even if this soup originated abroad or was influenced by foreign cuisines, today it’s a firm favourite in southern Vietnam. 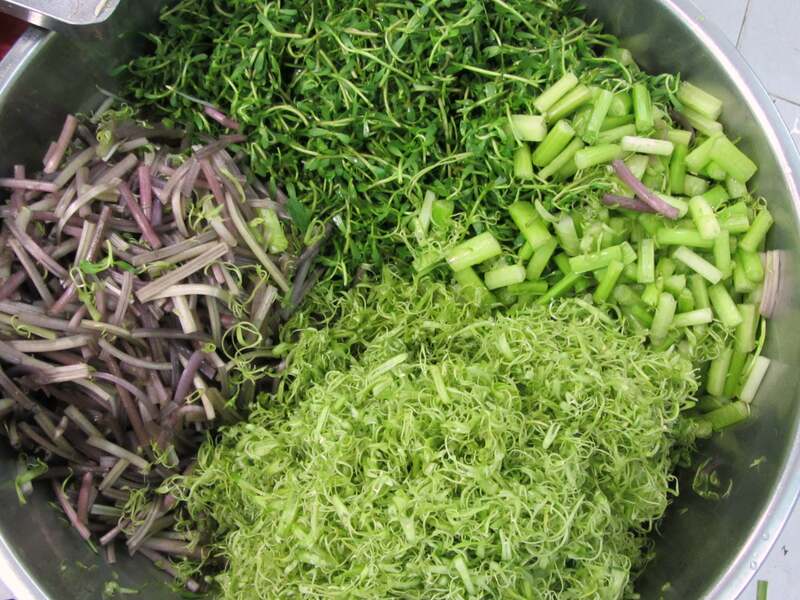 One of the things that southern Vietnamese dishes (especially soups) are famous for is the plethora of fresh greens that they are served with. 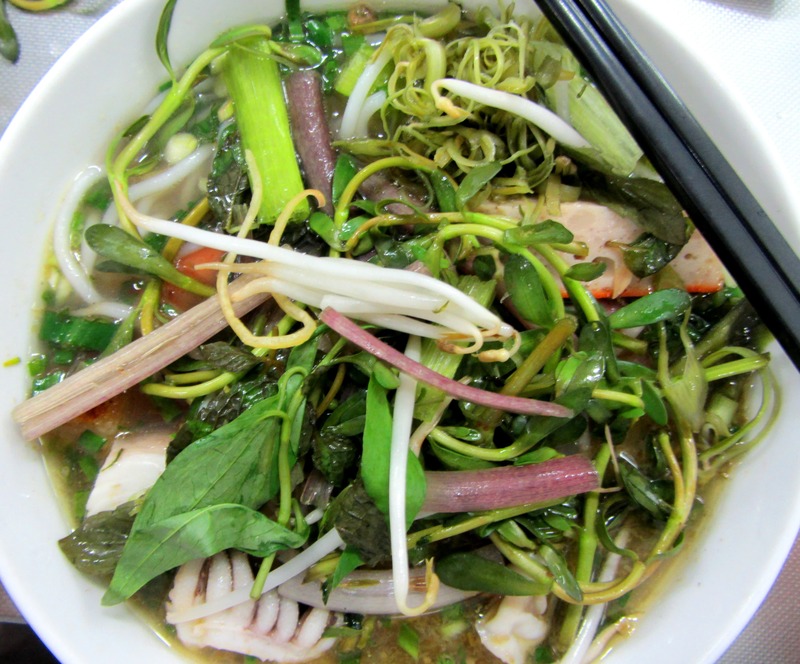 Even by southern standards, bún mắm is accompanied by a jungle of leaves, stalks, stems, flowers and herbs. These come on a separate plate, either uncooked or blanched in hot water. In amongst this forest of greens you’ll find the purple stems of water lilies, the yellow-white curls of banana blossom, bean shoots, a couple of varieties of ‘pond weed’ (there are so many kinds of pond weed that even locals have difficulty naming them), and a leaf popularly known in Vietnamese as giấp cá, which means ‘fish-smelling leaf’ (personally I don’t think it smells very fishy at all, and prefer to call it by one of its many other informal names, ‘heartleaf’). In the past, I couldn’t be ‘bothered’ loading up my already overflowing bowl with this superfluous salad. But, in my laziness I was missing out: these greens are not only full of flavour and nutrition, they also add a crunchy texture, and some ‘high’ notes to what is an otherwise ‘deep’ and brooding broth. Also, the stalks are absorbent, acting like sponges and soaking up all the flavours of the soup. As always, there’s the choice of adding chopped red chilli and a squeeze of lime to your soup. 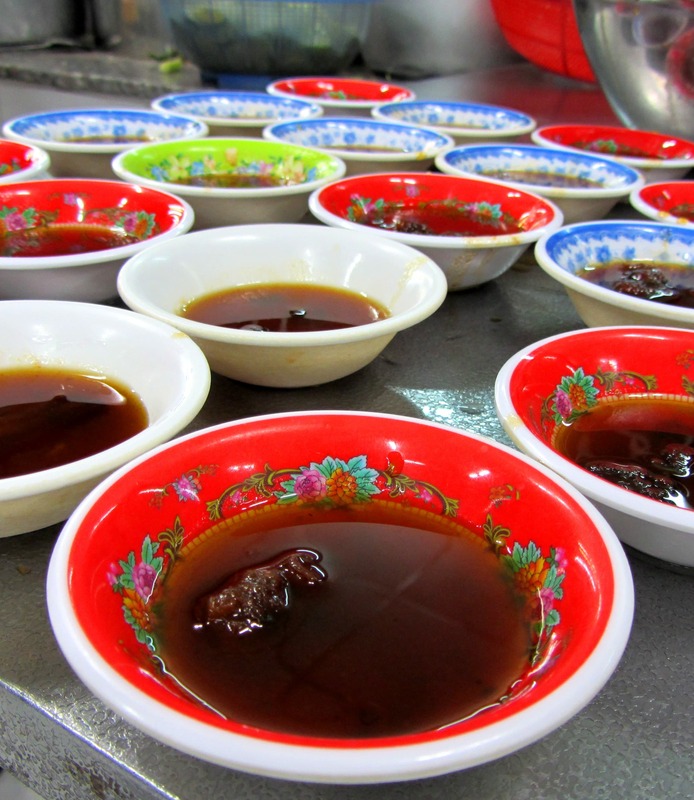 Another accoutrement, which seems to be unique to bún mắm, is a small dish of sweet tamarind sauce, for dipping any of the chunky bits from your soup in. As the broth is already very sweet, I’ve never understood the need for this dip. However, people say that southern Vietnamese have a particularly sweet tooth, so perhaps that explains it. Once all the three elements – bún and mắm, the chunky bits, and the greens – are mixed together in your bowl, there’s a war of flavours and textures going on in there. The broth is at once light, sweet and tangy, but also thick, heavy and pungent. The chunky bits are both delicate and hearty. The greens are crunchy and light, but also bitter and sharp. Your taste buds can get very confused: is it sweet, or is it savoury? The wonderful result of this ‘war’ is that no two mouthfuls are the same. 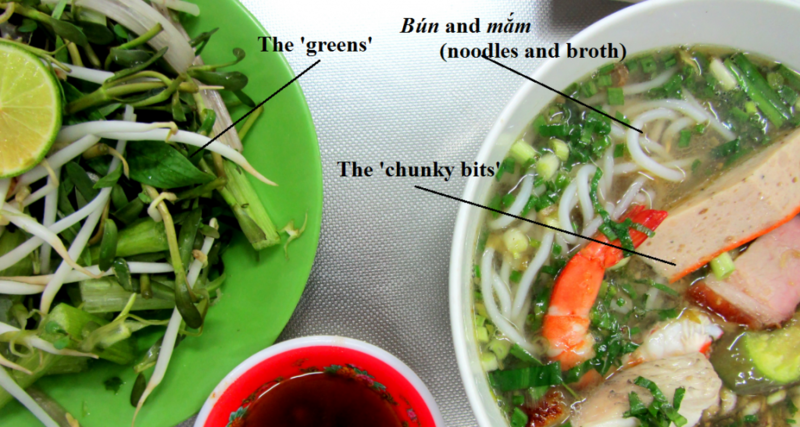 Bún mắm isn’t the easiest of Vietnamese soups to get into. But, as is so often the case with the very best Vietnamese dishes, the more challenging it is, the greater the reward. It’s a bit like jazz (for me, at least): I remember the first time I heard John Coltrane’s ‘Giant Steps’; it seemed like a big mess – where were the harmonies, the melodies? But each time I listened to it, I heard something new, and it started to make more and more sense, until it became one of my favourite albums – that’s what bún mắm is like. Bún mắm is available all over southern Vietnam, especially in Saigon and the larger towns in the Mekong Delta. As with any dish, quality varies from place to place. 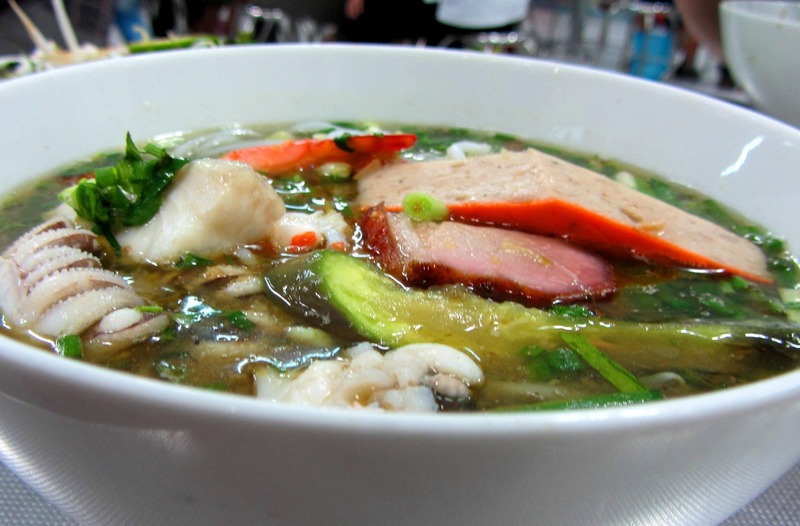 The best bowls of bún mắm are found in eateries that specialize only in bún mắm. 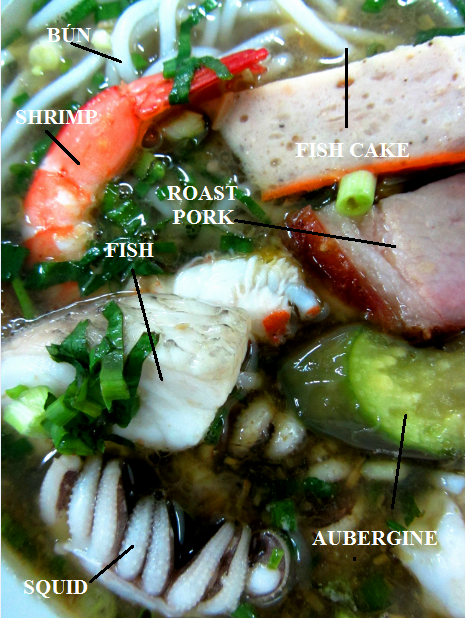 One such place is Bún Mắm 444 (address: 369 Lê Quang Định Street, Bình Thạnh District, Saigon; price: 40,000VNĐ [$2] a bowl). For me, this is the bún mắm by which all other bowls are judged. 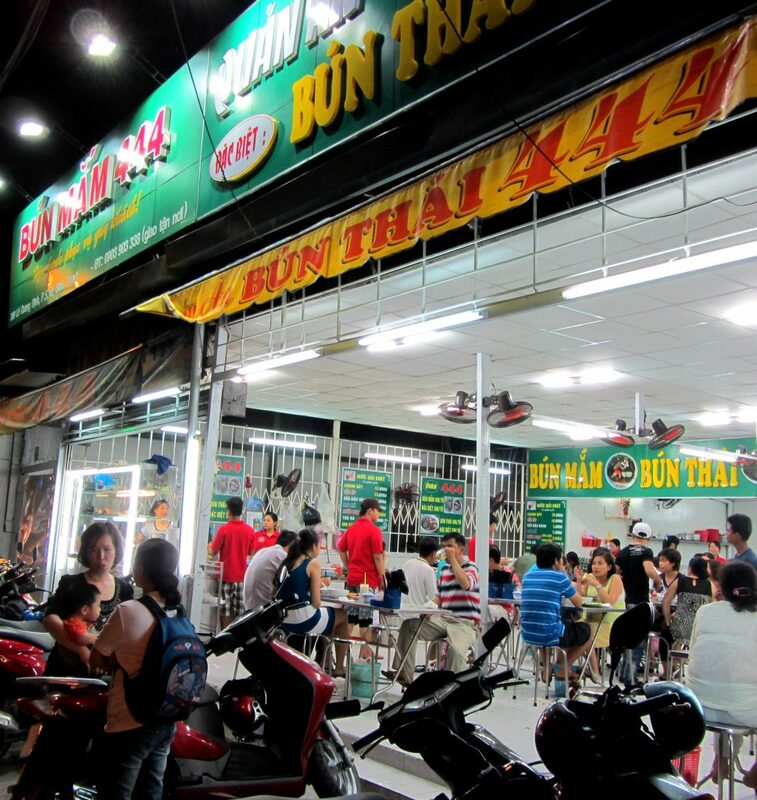 Always busy, bustling and very efficient, Bún Mắm 444 is popular (even famous) among Saigonese. The roaring trade they do here must have brought the owners some extra cash, because they’ve recently smartened it up and expanded the premises to twice its original size. I tend to get anxious when my favourite eateries go through this process; sometimes it can mark a shift in priorities, from food to décor. 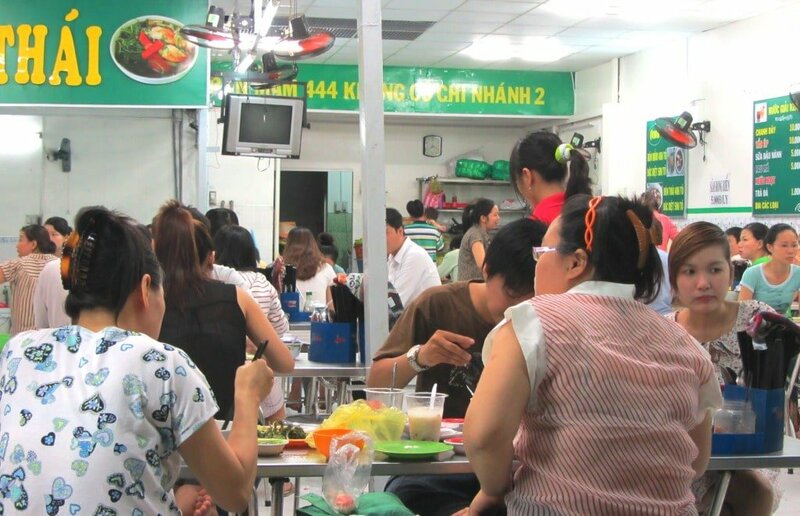 Happily, this is not the case with Bún Mắm 444: the brightly repainted walls, shiny new metallic stools and tables, and the garish new signage has made dining here a little more comfortable, but the soup is unchanged and delicious as ever. What’s more, there’s now extra space to accommodate the crowds that flock here, especially after work, between 4 and 7pm. Bún Mắm 444 is classic Vietnamese road-side dining: open to the street, the noise of passing traffic mingling with diners’ conversations, fast service, fast eating (no lingering – it’s all about the food), a dirty floor of food-related debris (always a good sign, in my opinion), and of course, a great soup. Bún Mắm 444 is a little way north of central Saigon, but it’s well worth the 15 minute taxi or motorbike ride out here for good food in a lively setting. 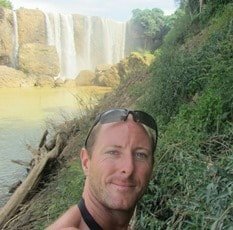 This entry was posted in ALL, DESTINATIONS, FOOD & DRINK, Noodles, Saigon, Soups, Street Food, The South and tagged bun mam, food, guide, Ho Chi Minh City, Saigon, soup, street food. Bookmark the permalink. 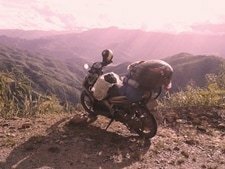 I’m really like the way you described bún mắm. Like Jazz!! I can’t find another image more sexily, faithfully than for a complex dish (in my opinion) like this. 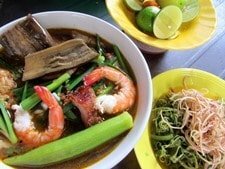 Have you ever tried bún chả. It likes bún thịt nướng but follows northern style. Nước mắm of this dish nears a kind of soup. It has the slight taste and be served more than the bún thịt nướng.